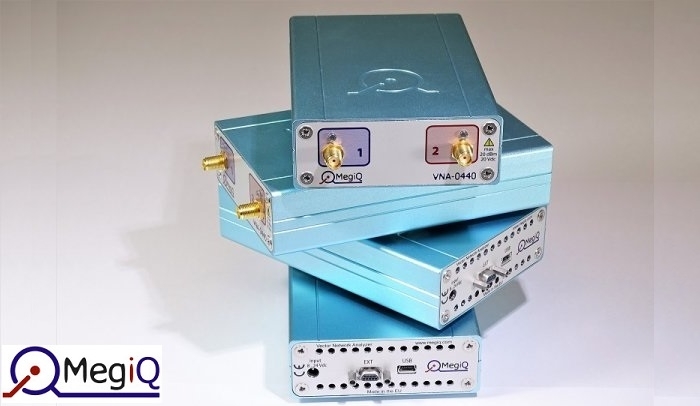 MegiQ, a developer of modular vector network analyzers has released new custom cabinets for its VNA-0440 and VNA-0460 series of vector network analyzers. The cabinets are a two piece milled aluminium casings that integrate all the different shielding measures that MegiQ has been using in the previous versions. The MegiQ VNA-04x0 / VNA-04x0e are compact Vector Network Analyzers that are used for professional antenna and network measurement and optimization. With a frequency range of 400 MHz to 4 GHz and 6 GHz they are very well suited for characterization and measurement of S-parameters of 1, 2 and 3 port networks such as antennas, matching networks, amplifiers, filters, power splitters etc. They cover all popular communication bands that are used worldwide like characterized wireless devices of today, such as IOT devices, routers, phones, domotica products, electronic gadgets, tablets, laptops, RF-modules etc. The MegiQ VNA-0440 is widely used for developing professional and consumer wireless products. The new cabinet for the VNA series, looks better, is more robust, improve shielding and has better thermal behavior, resulting in much quieter operation.